The STR2 is hardly more than a carryover of the all new Red Bull RB3. While the STR was an older car, the new car is a huge improvement. The chassis is completely new as Adrian Newey designed a car to his likings and following his experience from McLaren. While the team was lagging slightly on developments performed by Red Bull Racing Technologies, the car was vastly slower than the car run by Red Bull. It is important to know that Newey and his design team at Red Bull designed the new car for the championship winning Renault engine that was fitted in the RB3. The adaptation of the chassis and a possibly inferior engine (mainly in packaging) meant the team lacked performance to grab a lot of points. Mid season, after the European Grand Prix, Scott Speed got replaced by BMW Sauber's test driver Sebastian Vettel. 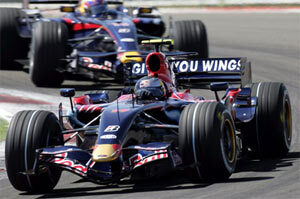 At that point, Toro Rosso and Spyker F1 were the only teams not to have scored points in 2007. Chassis: Composite monocoque structure, designed and built in-house, carrying the Ferrari V8 056 engine as fully stressed member. Transmission: Seven speed gearbox, longitudinally mounted high-pressure hydraulic system for power shift and clutch operation AP Racing triple-plate-type clutch. Front suspension: Upper and lower carbon wishbones and pushrods. Torsion bar springing and anti roll bar. Rear suspension: Upper and lower carbon links and pushrods. Coil springs and torsion anti-roll bar. Brakes: Brembo calipers, hitco carbon disks and pads. Fuel management: Magneti Marelli digital electronic injection.